If you want the best Truck Sat Nav, you need to understand that your navigator is going to work in a slightly different way as it needs to take into account that you’re driving a larger vehicle that will not fit under the average bridge and will not allowed down many roads or streets. For this reason when you’re buying a Sat Nav for your Truck or HGV you need to make sure that you by a specific navigation system that has been specifically designed for use with your Truck, HGV or Campervan. Truck Sat Nav’s work by calculating your route based on a selection of criteria such as the length, width, height and weight of your HGV and therefore provide direction that will take you around low bridges or restricted roads. These type of Satellite Navigation systems also come with larger screens and points of interest databases that come with specific place where you can park your Truck or Campervan over night. 2018 was a terrible year for trucking reviews as there were really no new models on the market. TomTom tried to update their Trucker 6100 from 2016 and while they brought a wealth of knowledge and experience, and offered a superb value for money, everyone focused on the same problem with the TomTom Trucker device. It did not come with a long-term contract for Traffic updates meaning that after the initial free year, you had to take out an expensive contract. 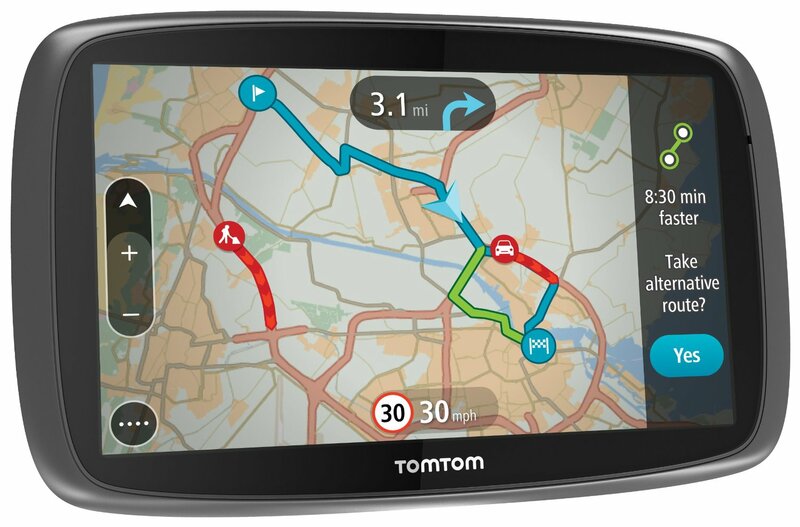 Great for TomTom, not great for the consumer, and not great when Garmin offered this for free. "Don't want to read the whole review and simply want the best - "check it out in action here"
Garmin offered the Garmin 770 LMT-D which came with the same, if not a better menu and turn-by-turn directions and more importantly free lifetime map updates and traffic for the life of the device. Garmin also introduced us to the Garmin DezlCam Truck Sat Nav which comes as standard very similar to the 770LMT-D but with the added benefit of a dash cam that has been built right into the sat nav and therefore gives the user the ability to record video showing the front and rear of your truck. The idea here, if you've got into an accident, the images are safe and you can easily determine whose at fault. We do like the idea of the DezlCam, however it's not the best at either being a navigator or a dash-cam. "Garmin Trucking Navigators are simply better than TomTom's - "check it out in action here"
If you want a dash-cam, but this, however personally we don't need this. Yes with the 6250. There is a 6200 that comes with limited traffic updates. It’s a decent upgrade and great navigator, but its not as good as the one above. Its a decent model, but when you factor in the price, it's a no for me. Getting a little old now and will start to struggle with the latest map updates. 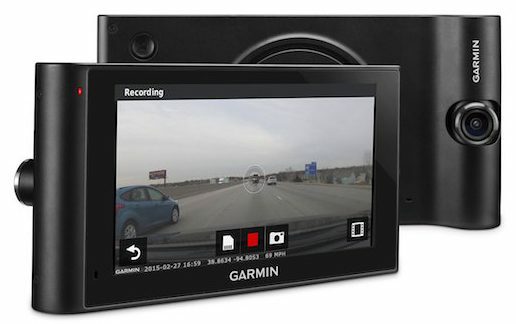 For 2019, Garmin have updated their fantastic Dezl 770 LMT-D to a Dezl 780LMT and a DezlCam 785 LMT-D to which Garmin have added a built in DashCam. The idea behind these two models is to take advantage of what Garmin have built-on with their 770 and improve the mistakes that used to drive us all crazy. The key problems were small things such as after a recalculation if you’re exit is the next turn off, the unit will take you all the way around the roundabout to take that turn off which is right in front of you and the screen is too cluttered up with symbols meaning that when you get into town, you can't see which route to take. Both models, comes with a 7-Inch touchscreen, pinch-to-zoom display that comes pre-loaded with maps and truck-related information. There is the option of a 5-Inch screen, however we would avoid this model as it’s just too small. Once you’ve switched on the unit, simply add your truck information (customisable by height, weight, length, width and hazardous materials) and the unit will show you suitable routes that avoid any restricted zone. The maps are fantastic and come as standard with maps of Europe, lifetime updates (All through Wi-Fi) and live traffic updates either using your smartphone or through the DAB receiver within the unit. Directions are step-by-step and in addition to the onscreen directions, the Dezl range comes with extra powerful speakers so you can hear through the noise of your truck. There are a lot of extra features that it comes with such as truck-related route warnings for bridge heights, sharp curves, steep grades, Bluetooth for voice-activated navigation, wireless calling through its integrated microphone and speaker and a massive point of interest database specifically for professional drivers, however the features we really love and the ones that we actually use of a daily basic include the ability to add a backup camera to the GPS unit, the trip planner feature that allows you to create multiple-stop routes and with the 785, the ability to have a built in dash-cam that automatically records HD video which is saved should you be involved in an accident. 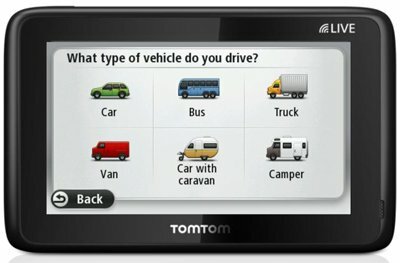 Its been a few years since TomTom brought to the market a new Trucking specific GPS unit. There last unit was released in 2016 and quite frankly, we did not like it at all. 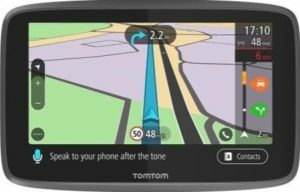 The biggest problem, TomTom offer a way to get free map updates, however up until recently, there was no way to get traffic updates without using your mobile phone connected to the GPS via Bluetooth. This meant your mobile phone was always using data and could in the long run cost to provide traffic information that the Garmin gave for free. This has changed with the Professional 6250. This all-new 2019 Trucking specific unit comes in two models, the Professional 6200 (with 1-year TomTom Traffic and Speed Cameras) and the 6250 (with Lifetime TomTom Traffic and Speed Cameras). While it’s difficult to say exactly how long your navigator will last, it safe to say, it’s at least three years and with there being only a small price difference between the two models, the 6250 is the better option to go for. Key features we really like include Bluetooth for voice calling and access to either Siri or Google Now which always means you now have a virtually limitless points of interest database. 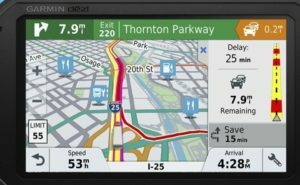 The other key feature we really like is TomTom’s “MyDrive” that allows you to plan your route on your computer and upload it directly to your navigator. Overall, it’s a decent upgrade and great navigator, but its not as good as the one above. 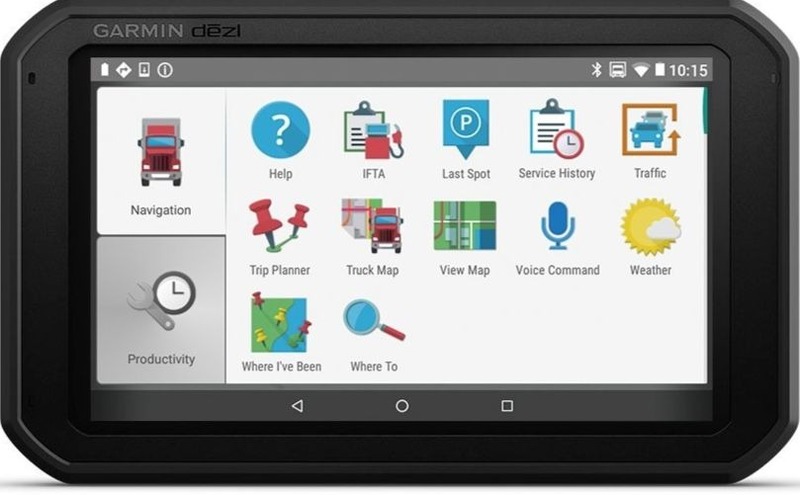 The Garmin Dezl 770 LMT-D Truck Sat Nav is the all new 2017 version of the 760LMT that we have reviewed last year and thought was our best truck sat nav unit. What’s interesting is that we still use out 760LMT and quite frankly even though it’s getting a little old and dated, it’s still a fantastic model that comes with a range of features that are still up-to-date even a few years after it was designed. 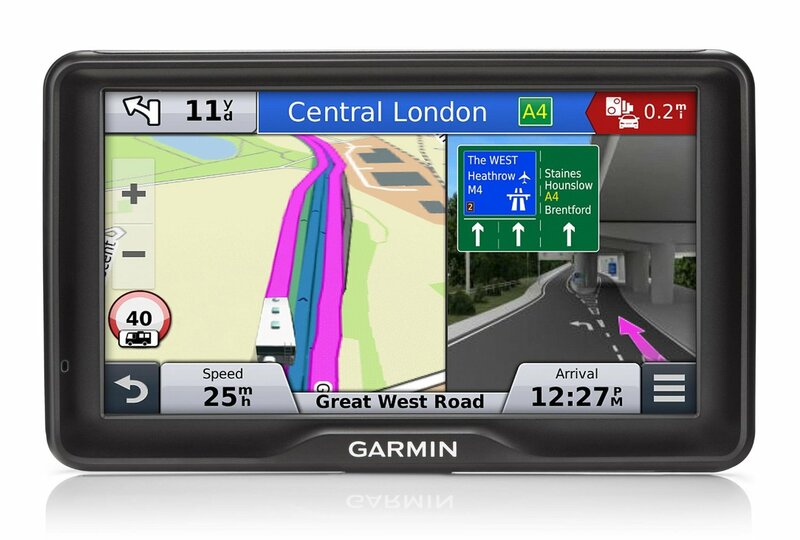 The new 770LMT is part of a range of two 2017 Garmin models with the 770LMT coming with a 7-inch screen, whilst it’s baby brother being the 570LMT that comes with a 5-inch screen and therefore might be more suitable for smaller vans. Our favourite is the 770LMT that comes with a 7-inch screen as it offers the freedom and flexibility to see your directions, whilst at the same time add your location or alter your destination whilst your wearing gloves given the screen is a glove friendly screen. Switch on the unit and you can enter your trucks length, width, height and weight meaning that the sat nav will calculate routes taking into account your trucks dimensions and any traffic along your route. The Garmin comes with free lifetime traffic updates that allow you to stay out of the worst of the traffic. Maps are fantastic and provide detailed routes and building locations to help you find your destination. If you reach a difficult junction, the unit switches to a dual orientation screen meaning that on one side of the device you have your route and directions and the other lane guidance showing you which lane you should be in. Extra features include free lifetime traffic alerts to keep you out of traffic, free lifetime map updates, free speed camera alerts, road conditions ahead and even any sharp corners or steep hills that will give you time to prepare if needed. Bluetooth comes as standard meaning that you can make a receive calls using the in-built speaker and even connect the wireless back up camera to help you when you need to reverse your truck. The T﻿﻿o﻿﻿mTom T﻿﻿r﻿﻿ucker 6100 has been designed to help truckers find the fastest and safest routes for long journeys and comes as standard with real-time traffic alerts, speed camera alerts and lifetime map updates. The unit comes with a superb 6-Inch screen that allows for the maps that are 3D Maps that allow you to see buildings and landmarks in both low light conditions and in direct sunlight. Once your ready to go, switch on your sat nav and enter your truck’s height, length, weight and width meaning that the sat nav will only show you routes that your truck is allowed to travel down. The interface is easy-to-use and allows you to easily enter your destination using the Intuitive search results that make it easier for drivers to find the destinations they need in TomTom's database, while the Tap and Go feature speeds up the process of setting a destination. Drivers can also use voice commands to control the device, which is an essential feature while on the road.Routing is provided both by turn-by-turn directions and using the in built speaker that speaks to you using a friendly tone to help you get to your destination. Should you reach a difficult junction, the routing software will show you which lane you should be in using brightly coloured arrows. Extra features include a free Lifetime Maps subscription, a one-year subscription to TomTom Traffic and TomTom Speed Cameras, the ability to save destinations and routes so they are easy to access and add preferred stopping points into the device, so that it can calculate routes that include these stops and the ability for you sat nav unit to communicate with other devices. Drivers can pre-plan routes using their smartphone or computer from their home or office. When they get into the truck, the route will already be programmed into the TomTom GPS unit, enabling a speedy start to the journey.Overall, the T﻿﻿omTom Trucke﻿﻿r is a brilliant Trucking sat nav that has been designed with truckers in mind but can actually be used for use in any type of vehicle from truck’s, van, bus or even car’s by switching between different profile settings to plan suitable routes. There is just one problem, being the lack of free lifetime traffic updates. The Garmin DezlCamTruck Sat Nav is Garmin's all new and improved sat nav design and comes with a range of features that includes both a brilliant sat nav that provides turn-by-turn, step-by-step directions on a large 6-inch screen and a camera that provides both front and back recordings to help you decide whose at fault if you are even in an accident. 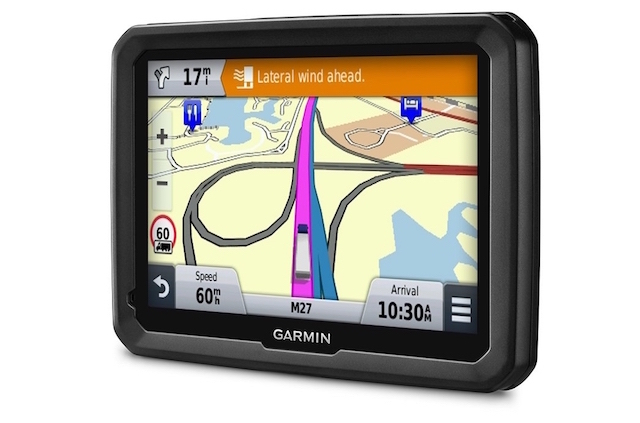 The sat nav has been specifically designed for truckers in mind given that it comes with a large six inch screen, step-by-step, turn-by-turn directions that allow you to follow routes that have been designed specifically for you as a trucker and take into account both the traffic situation and your trucks dimensions. 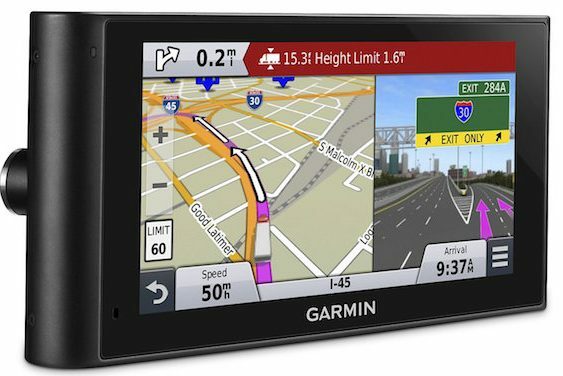 The sat nav has been specifically designed for truckers in mind given that it comes with a large six inch screen, step-by-step, turn-by-turn directions that allow you to follow routes that have been designed specifically for you as a trucker and take into account both the traffic situation and your trucks dimensions. When you switch on your device, you will taken to a screen where you can enter your trucks length, width, height and weight meaning that when you choose your route, this is taken into account. The device also comes with trucking specific points of interest such as petrol stations or over night stations where you can stay the night, weather alerts, and voice activation that lets you control your device with your voice and Bluetooth meaning that you can connect your smartphone to the device for hands free calling.Other than directions the unit also comes with a built in camera that allow you to record everything in-front of you as you drive and given that you can attach a camera to the rear of your truck and use the Bluetooth to collect images from the rear using a rear facing camera. The camera record is 720 resolution which is not a good as the latest dashcam’s but does provide clear images in both dark and light conditions. The images are saved onto an 8GB card that works on a loop system meaning that you can continually record onto one SDcard. If you get into a collision, the Incident Detection system automatically saves the footage meaning that you can play it all back with the touch of a button. Overall the Garmin Dezl works well, however it camera is not as good as the best dash cameras that we reviewed earlier and having the dash camera means that the unit is slightly larger and bulky than the best truck sat nav the 770LMT-D above. The Garmin Dezi range comes in two model’s the 760LMT and the 560LMT with the difference being that the 760LMT comes with a 7-inch screen and the 560LMT comes with a 5-Inch screen, with our favorite being the 760LMT given the size of the screen. The 760LMT is our favourite Truck, HGV Camper and Caravan Sat Nav as it comes packed with features that are both useful and very easy to use. 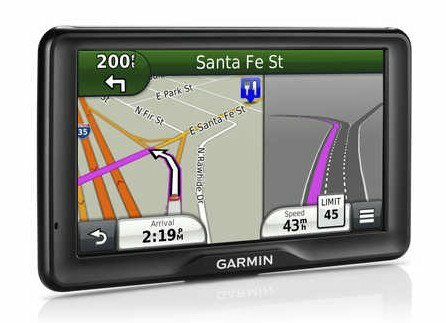 The Garmin Dezi is Garmin’s 2014 range of Sat Nav’s and comes with super-sharp touchscreen, a fast processor that have been designed to deal with route calculations, Bluetooth, Traffic Alerts and even Free Lifetime map updates. The high-resolution screen with WVGA technology that helps with colours helps with the detailed maps and turn-by-turn directions that will even speak street names through its in-built speaker. 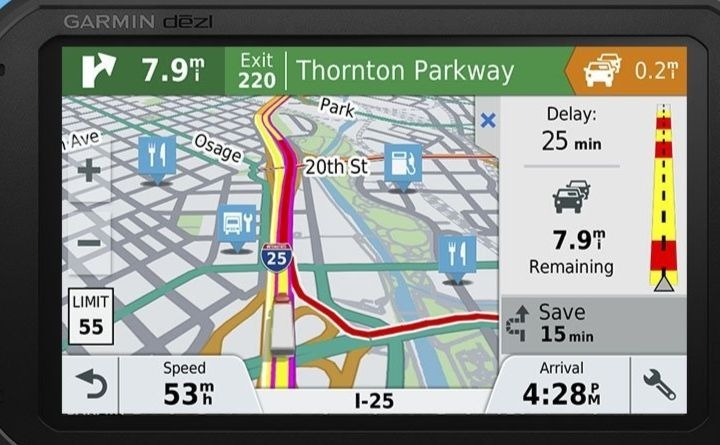 The Garmin Dezi is Garmin’s 2014 range of Sat Nav’s and comes with super-sharp touchscreen, a fast processor that have been designed to deal with route calculations, Bluetooth, Traffic Alerts and even Free Lifetime map updates. The high-resolution screen with WVGA technology that helps with colours helps with the detailed maps and turn-by-turn directions that will even speak street names through its in-built speaker. The out of the box device meaning that you simply need to put your Sat Nav on charge and enter your vehicles height, weight, length and width and the processor will calculate routes for you that will direct you around any difficult areas that are either not allowed to travel down or will not fit.With both models there is the option to use Garmin’s dual screen meaning that you can two sets of information showing on your screen at anyone time. This means that if you come across a complicated junction the device will automatically split into two screens with one showing your usual direction and the other will use animation with arrows to help you pick the right lane to get you to your destination. Garmin also has the added benefit of “PhotoReal” which uses helicopter views of the junction all to help you be in the right lane to take the correct exit on the motorway. Extra features are included with the Dezi range including voice-activated navigation meaning that you can speak directly to your Sat Nav to change your location or access other features, and Blue-tooth hands free for connectivity meaning that you can use your navigation system as a hands free telephone. For route calculations, not only does your unit take into account for your vehicles dimensions, it also takes into account for traffic alerts with any traffic jams. 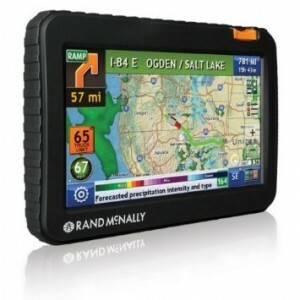 The Rand McNallyTND 720LM is one of the best Trucking Sat Nav Models on the market that has not been designed by a main stream manufacture in the sat nav world of designing and manufacturing sat nav units. Rand McNally, however do have a wealth of experience given that they have over 85 years in the commercial transport industry and thus their sat nav units come with many useful features that you will not see on other trucking sat nav units across the market. On average they come with over 40% more useful features when compared to other HGV navigation units on the market today. The Unit comes with a super sharp, high resolution 7-Inch touchscreen and a superb built-in speaker meaning that you can hear your units directions even if you have the windows down.The massive screen and super fast processor means that the maps are exceptionally easy-to-use and provide you with lots of information that is going to be useful in getting you to your destination. The large screen also provides you with lots of information to help you with your directions such as junction view which give you a 3D display of an upcoming junction and active lane-guidance which uses bright arrows to show you which lane you need to be in. The Sat Nav also comes with WiFi connectivity which brings a selection of features such as your current and forecasted weather or up to date routing calculation which take into account Road Work updates and enhanced truck routing options such as Exit Quick View to help find truck-friendly locations along your route. 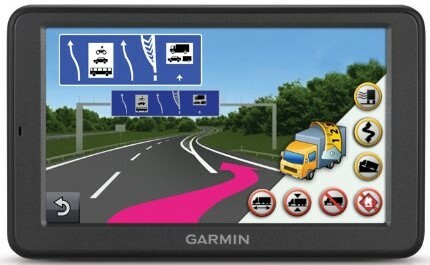 If the Garmin Dezi is our favourite trucking sat nav range, then T﻿﻿omT﻿﻿om Pro 5150 is a very close second. You’re buying a Sat Nav device from one of the mainstream manufactures and as a result you know that you’re buying a quality design that comes with a range of features that have all been designed to help you get your truck from A to B using step-by-step direction that have taken into account both your trucks dimensions and the traffic in the surrounding region. The device comes with a high resolution 5-inch screen and a super fast processor meaning that your route calculations are both quick and detailed. As with all Truck Satellite Navigation units, you can set your route calculations to take into account your trucks dimensions, but with the TomTom Pro, you can also calculate routes that avoid tight road turns or use your unit as an online logbook to ensure that you’re always working within the UK regulations. The interface is very simple and the touch screen menu with predictive text meaning that you can easily enter your destination into the unit. The maps which are detailed are shown on the screen and come with turn-by-turn direction that take into account not only traffic jams, but also weather and the type of road that your driving on. When you approach a difficult junction, your unit will automatically switch into junction mode which use TomTom’s active lane guidance to show you which lane you should be in to follow your directions. 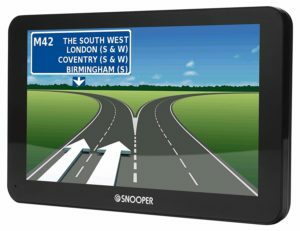 The built in computer, helps to power your GPS unit with a whole host of extra features such as speed alerts which show you where any speed camera are located, your current speed and the road speed. It also powers a few other features that will help you with your navigation such as Bluetooth meaning that you connect your smartphone to the unit for hands-free phone calls or a database that your unit will use to store thousands of points of interest that are all trucking, HGV and campervan specific meaning that if you want to stop over night to sleep in your campervan, your sat Nav device will help you find one.